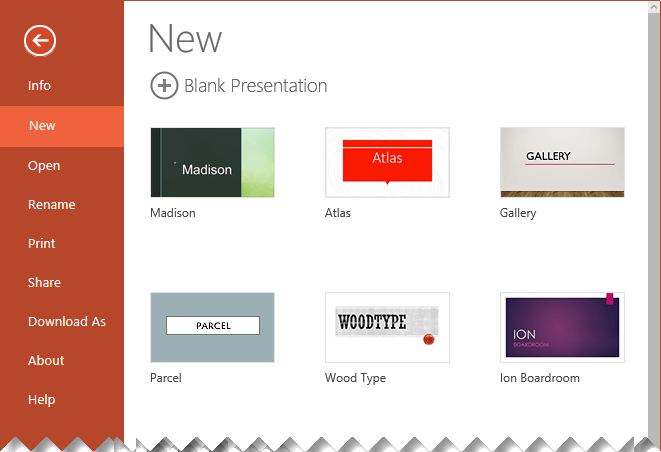 PowerPoint Online comes with themes—sets of professionally designed layouts, fonts, and colors. After you select a theme, all your slides will follow that look. On the Design tab, pick a theme. Select from one of the four color variations for that theme. If you want a blank white presentation to start with, create a Blank Presentation. A new presentation opens with a white background. Every presentation has a theme, but you can make yours blank by selecting the Office Theme. On the Design tab, in the Themes group, select the first theme at the top left of the gallery, Office Theme. PowerPoint Online doesn't offer the ability to save a custom theme. If you'd like to see this feature added to PowerPoint Online, please go to our suggestion box to vote for it. You can simply change your slide background without using a theme. For more information, see Change the background of your slides. Apply a theme to one slide? Themes apply to all slides in a presentation. But if you are an Office 365 business subscriber, you can use PowerPoint Designer to get design ideas for individual slides while working with a blank presentation. For more information, see Create professional slide layouts with PowerPoint Designer.